The IT Crowd is a British sitcom by Channel 4, written by Graham Linehan, produced by Ash Atalla and starring Chris O'Dowd, Richard Ayoade, Katherine Parkinson and Matt Berry. 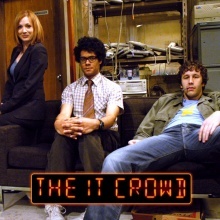 The "IT" in the show's title can be pronounced as either the word it, as in "the 'it' crowd", or as the letters I.T., as in the abbreviation for information technology. 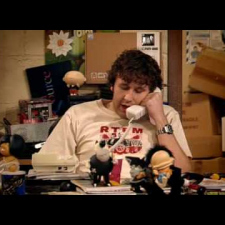 Set in the London offices of the fictional Reynholm Industries, the show revolves around the three staff members of its IT department: a geeky genius named Maurice Moss (Ayoade), the workshy Roy Trenneman (O'Dowd), and Jen Barber (Parkinson), the department head/Relationship Manager, who knows nothing about IT. The show also focuses on the bosses of Reynholm Industries: Denholm Reynholm (Chris Morris) and his son Douglas (Berry). The comedy premiered on Channel 4 on 3 February 2006, and ran for four series of 6 episodes each. 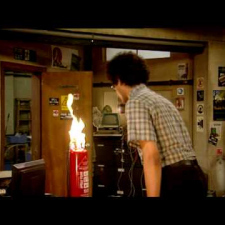 The IT Crowd - S01E02: Fire!